this is a Poplar body ( VERY LIGHT ) under 4lbs. The Body with Stets Bar and Pickups and Electronic Cover is 4.6lbs. It was a project that I don't have time to continue. Stetsbar T-Style Guitar Tremolo/Vibrato Pro II alone is worth 229.00 USD (300 Canadian). The Body I got in USA. The pickups are cheap overseas Pickups. The neck pocket matches all Fender Standard Specs. You will need to Shim up the neck due to the STETS BAR. I will provide the maple shims from Stewmac in the deal. Guitar Body, Stets Bar Pro II, Control Plate, Pickups, Pickup ring and shims. If you need anything else let us know. You may need the Stets Bar for another body, keep this body for another project. However you look it, your getting a sweet little package here. 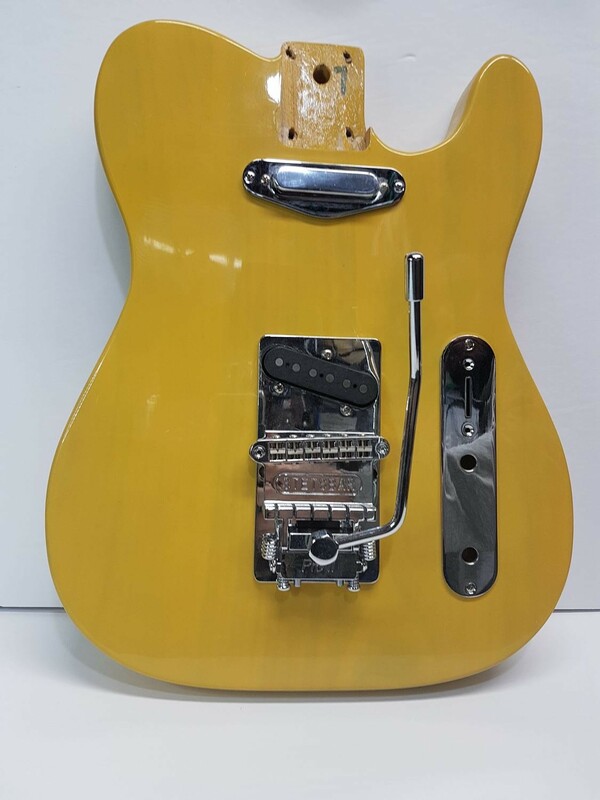 The Stetsbar T-Style tremolo has been constructed to retrofit to Telecaster® style guitars from Fender and other guitar brands. The base plate allows for both the 4-in-line and 3-in-line mounting holes found in the "ashtray" bridge. A 'blank' neck shim is supplied to adjust the neck angle for a perfect playing action where necessary. The shim should be adapted to suit.